Schnitzler syndrome is a rare disease first described in 1972. We can find in patients suffering of Schnitzler syndrome symptoms like: chronic hives (urticarial rash), fever, arthralgia, bone pain, lymphoadenopathy, hepato- or splenomegaly, leukocytosis: Further clinical investigation shows an increased erythrosedimentation rate , C-reactive protein and monoclonal gammopathy. Due to the wide spectrum of signs and symptoms, patients are cared for by different specialists and sometimes it can take years before the correct diagnosis is determined. Moreover the increased risk of lymphoproliferative disorders needs to be carefully considered. The pathophysiology of Schnitzler syndrome is largely unknown: both autoimmune and autoinflammation mechanisms may be present in the disease. From an epidemiological point of view, up to now 94 cases have been reported in the literature. The majority of reported cases is still of French origin maybe because the disorder was originally published in French by a French physician. Recently, however, cases have been reported in countries all over the world. Of the 94 cases, 57 are male ( male:female ratio , 1,6). The mean age of onset is 51 years. There are no indications that Schnitzler syndrome is a familial disorder. Schnitzler syndrome is highly likely to be underdiagnosed. The main hallmark of this syndrome is a chronic, recurrent urticarial rash, which is the first symptom to appear. Chronic urticaria is defined as episodes of urticarial outbreaks that persist between 4 and 36 hours and recur for a duration of at least 6 weeks. The frequency of urticarial eruptions differs greatly among patients. It ranges from daily to twice a year. Individual lesions last 12 to 36 hours and resolve completely without scarring, while new ones appear daily. 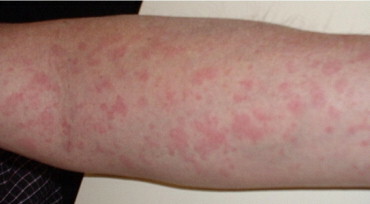 The urticarial rash consists of annular erythematous and maculopapular lesions that are 0.5 to 3 cm in diameter. Pruritus is usually absent at the onset of disease, but lesions became pruritic in approximately 45% of patients after several years. The rash affects primarily the trunk and the extremities, sparing the palms, the soles, and the head and neck areas. Other possible factors, which can influence the onset of the disease, are such as alcohol, spicy food, and stress. Recurrent fever is the second most common symptom observed in about 88% of patients. Like the urticarial eruptions, the frequency of febrile episodes differs greatly among patients; it ranges from daily to twice a year. The episodes usually resolve within a few hours but can persist for up to 24 to 48 hours. Peaks over 40°C are common. The fever and rash usually, but not always appear simultaneously. About 80% of patients complain of relapsing arthralgia; the large joints (hips, knees, wrists, and ankles) are affected. Joint destruction or deformities have not been reported. Bone pain has been reported in 72% of cases, typically in the tibia and ilium. Other bones were incidentally affected, including the femur, forearm, spine, and clavicle. 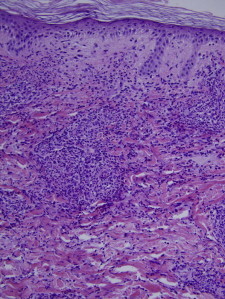 Lymphadenopathy in the axillary and inguinal regions can be present in about 44% of patients. The lymph nodes can be enlarged as well (up to 3 cm large in diameter). In these cases a biopsy of the lymph node is done to to exclude the presence of lymphoma. Hepatomegaly is very common symptom; splenomegaly is present in about of 12% of patients. Many patients suffer from fatigue and weight loss is common. 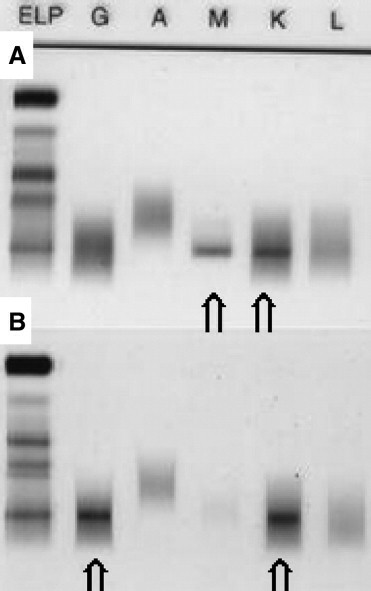 monoclonal gammopathy ( Immunoglobulin M gammopathy: detected with serum immunoelectrophoresis ; occurs in all patients; in some cases, however, serum protein electrophoresis may not detect the IgM gammopathy because the levels can be very low. All cases are associated with an IgM monoclonal gammopathy. Most cases are of the IgM-kappa isotype. A few cases of IgM-lambda and IgM-kappa/lambda have occurred. The serum IgM levels are usually less than 10 g/L. A small number of cases of patients with clinical features of Schnitzler syndrome had an associated IgG gammopathy rather than an IgM gammopathy—an IgG variant of Schnitzler syndrome) ESR, elevated erythrocyte sedimentation rate(found in most cases) elevated C-reactive protein level (also detected in most cases) a neutrophilic infiltrate on skin biopsy When even one of these signs is present, appropriate tests should be performed in search of an associated monoclonal gammopathy, if not already known. Major criteria: Chronic urticarial rash +, Monoclonal IgM or IgG Minor criteria: recurrent fever, objective findings of abnormal bone remodeling with or without bone pain, a neutrophilic dermal infiltrate on skin biopsy, leukocytosis and/or elevated CRP. Diagnosis of Schnitzler syndrome was established on the basis of documentation of an urticarial rash and monoclonal gammopathy (major criteria) plus at least 2 of the minor criteria. Schnitzler syndrome has a favourable prognosis in term of mortality with a survival rate of 94% after 15 years. Patients, however, have an increased risk of malignancy ( lymphoproliferative disease ). This syndrome has been associated with various lymphoproliferative disorders, including lymphoplasmacytic lymphoma or Waldenstrom’s disease (WM), multiple myeloma, and marginal zone B-cell lymphoma. It must be said that these associations are typically infrequent. The average time to development of malignancy was 7.6 years from onset of signs and symptoms of Schnitzler syndrome; 45% of patients with Schnitzler syndrome ultimately had lymphoproliferative disease. The patients that have progressed to develop lymphoplasmacytic neoplasias, can also develop a lymphoproliferative disorder called Waldenstrom’s macroglobulinemia (WM) as well. Waldenstrom’s Disease is a rare disease characterized by the presence of lymphoplasmacytic cells in the Bm and IgM monoclonal protein in the serum. The origin of the malignant clone is thought to be a B cell arrested after somatic hypermutation in the germinal center and before terminal differentiation to plasma cells. The manifestations of the disease include clonal infiltration of the BM, lymph nodes. Malignant evolution of Schnitzler's syndrome is a rare complication, but emphasizes the importance of long term follow-up. Waldenström’s Disease has been reported to occur in 15% to 20% of patients. Prognosis of WM depends on 5 major factors: age, anemia, thrombocytopenia, β-2 microglobulin, and IgM level. Patients with Waldenstrom’s disease, multiple myeloma, and marginal zone B-cell lymphoma have a reduced life expectancies. Life expectancy for Waldestrom’s disease is 6,5 years, for multiple myeloma is about four years and for marginal zone B-cell lymphoma is about 5 years. the bone marrow aspirate shows increased lymphoplasmacytoid lymphocytes with scattered plasma cells. The pathophysiology of Schnitzler syndrome is largely unclear. 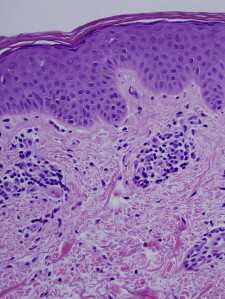 Deposits of monoclonal IgM were shown at the dermoepidermal Junction as well as on capillary walls suggesting the possible induction of local inflammatory reaction but IgM deposits are present in less than 30% of patients with Schnitzler syndrome and also occur in subjects with Waldeström macroglobulinemia without urticaria; so the deposits represent an epiphenomenon than a causal element in the disease. Several hypotheses have been proposed, but the recent success of treatment with the IL-1 inhibitor, Anakinra seems to indicate a role for IL-1 as an important mediator in the pathophysiology of Schnitzler syndrome. IFN-α, that increases the expression of IL-1 receptor antagonist (IL-1Ra), has been found to improve the clinical manifestations of Schnitzler syndrome supporting a pathophysiological role for IL-1. IL-1RA inhibits the activity of interleukin-1 by binding to receptor IL1R1 and preventing its association with the coreceptor IL1RAP for signaling. Binds functional interleukin-1 receptor IL1R1 with greater affinity than decoy receptor IL1R2 . IL-1 is responsible for various clinical manifestations such as fever, chills, skin rash, urticaria and even for neutrophilia, anemia and elevation in ESR. IL-1 induces the production of IL-6 by endothelial cells and indeed elevated IL-6 levels have been also demonstrated in Schnitzler syndrome. IL-6 is the main mediator for the hepatic secretion of acute phase proteins and for elevated ESR and induces platelet mobilization from bone marrow inducing peripheral "thombocytosis". The effects of IL-6 on B-cell differentiation could be responsible for the monoclonal gammopathy. (3) a mild mononuclear cell perivascular infiltrate in 14% of patients. Half the biopsy specimens in each of the 3 histopathologic groups showed eosinophils as a minor component of the infiltrate. The treatment remains a challenge. Nonsteroidal anti-inflammatory drugs (NSAIDs), corticosteroids, and immunosuppressive agents have been reported to provide variable relief from the symptoms of bone pain and arthralgias associated with Schnitzler syndrome. Skin and extracutaneous manifestations respond poorly to H1 and H2 antihistamines. Treatment with ciclosporin, colchicine, and dapsone had been ineffective. A few patients were responsive to treatment with thalidomide but the occurrence of peripheral neuropathy limits its use. Treatment with Rituximab, an anti-CD20 monoclonal antibody", is definitely stopped because it’s not effective. Anakinra, a recombinant form of the naturally occurring IL-1 receptor antagonist, appears to be the most promising drug for the treatment of Schnitzler syndrome at this stage. It was administered in some patient. Rituximab is a chimeric monoclonal antibody directed against the B-cell marker CD20. Its primary indications are B-cell malignancies, but it is increasingly used in autoantibody-mediated autoimmune diseases. The rationale for this approach is the elimination of B cells followed by a decreased production of antibodies. Although B-cell counts and the monoclonal gammopathy decreased, no improvement of symptoms was noticed after an administration period of 8 weeks. Because the B-cell counts had already reached zero levels, the treatment was stopped. Figure7: Temperature curves and acute phase response. Body temperature (black line) and CRP serum levels (dotted line) in a patient with variant Schnitzler’s syndrome before and during treatment (grey areas) with thalidomide (left panel) and, subsequently, anakinra (right panel). Administration of 100 mg thalidomide daily improved the condition of the patients: the fever and arthralgia vanished, urticarial lesions disappeared almost entirely, and the CRP level and leucocyte count normalised. Unfortunately, after 7 weeks the patients develope severe polyneuropathy, which is reversible when thalidomide is stopped. In the patients with Schnitzler’s syndrome we observed a rapid and complete remission after starting treatment with 100 mg anakinra SC daily(figure 7). Administration of anakinra led to a dramatic and very rapid improvement of symptoms in patient (figure 8). Anakinra is a recombinant form of the naturally occurring IL-1-receptor antagonist. It competitively inhibits the binding of IL-1α and IL-1β to the IL-1 receptor. Although it binds to the receptor, it does not induce signal transduction and acts as an antagonist. The immediate response to anakinra treatment may underline the pivotal role that IL-1 could play in the pathogenesis of Schnitzler syndrome. It was postulated that an increased frequency of IgG autoantibodies to IL-1α prolongs the half-life of IL-1α, change the tissue distribution and enhance the systemic effects of IL-1. In patients with Schnitzler’s syndrome a rapid and complete remission after starting treatment with 100 mg anakinra SC daily can be observed. The improvement of symptoms could be observed within 48 hours (the fever subsided, the skin lesions decreased in intensity, and the leucocyte count normalised. The CRP concentration decreased and the fever did not recur). Six months later the patient is still free from fever and urticaria, has gained weight, and is back at work. Thus, early administration is recommended.